At Cyclepedia.com we provide technical support to our members. We help our PRO subscribers with technical information on everything from the latest and greatest to forgotten flagship motorcycles. Recently we’ve been helping one of our PRO members that is diligently working on a 1985 Kawasaki Voyager 1300. 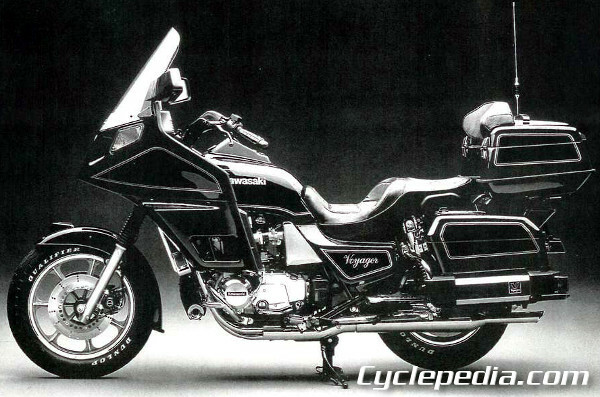 We currently don’t have a Cyclepedia Kawasaki manual for this bike but were able to reference the Kawasaki Voyager 1300 Motorcycle Factory Manual. So when your working on your bike be glad that you don’t have to deal with six cylinders, fuel injection, shaft drive, liquid cooling, electric compass, stereo, front and rear air suspension with compressor, air horn, electrically adjustable headlight, self-canceling turn signals and more than three decades of wear and tear all rolled into one. Keep at it JD!